Congratulations! If you’re reading this, you’ve probably just finished (or are about to finish) The Whole30 Program. And if you’re like many of us who’ve completed this life-changing program, your mind is most likely racing … It’s the moment you’ve been dreaming of for weeks! And now that it’s finally here, you may find yourself feeling a bit nervous as you ponder the big post-Whole30 question … What should I reintroduce first? But before we dive into how to properly reintroduce your most-missed morsels from the restricted foods list, it’s important to first do a little self-evaluation. Taking some time to think through your Whole30 journey will go a long way in helping you to better appreciate the positives you’ve experienced, and better recognize if perhaps more time is needed before you launch into the reintroduction phase of the program. Personally, I opted to do a Whole45 because as I evaluated my progress at the end of 30 days, I felt I needed more time to get past some of the unhealthy cravings I was still battling, and I felt I needed more time to detox and heal from a very unhealthy summer. I also wanted to better establish the self-control I had gained as a result of completing Whole30. Of course for some people, 30-days may be all that’s needed, while for others, a Whole90 may be in order. Only you can determine the best course of action at the end of your 30-day journey. But knowing what the best course of action won’t be clear, unless you take some time to evaluate your progress first. So back to the question we’ve all been pondering … What should I reintroduce first? 1) Start by making a list of the restricted foods you miss most and want to include in your diet either regularly, or somewhat regularly. Go S L O W ! I definitely encourage you to read through Whole30’s recommendations on how to successfully reintroduce restricted foods and check out their sample schedule – after all, they’re the experts who developed this amazing program. I also can’t recommend enough Whole30’s advice to go slow! In fact, I personally prefer going even slower than the Whole30 folks recommend. Why? Just because our body doesn’t immediately react when a restricted food is reintroduced doesn’t mean it’s an automatic “green light” telling us we can safely enjoy that food regularly, or even occasionally. That’s because some foods don’t cause an immediate reaction, but may take a longer period of time before we start to see how that food is negatively impacting our bodies. That’s why I prefer to reintroduce just one new food over a 5-7 day period of time, without introducing any other restricted foods during that week-long time span. In other words, if the food I’m reintroducing into my diet doesn’t appear to be causing a negative reaction, I continue to eat it daily for up to one week. Then I remove the food and go back on a strict Whole30 diet for 2-3 days and carefully evaluate how the reintroduced food impacted my body both physically and mentally. This helps me to better decide whether or not I want to incorporate this food back into my regular diet, and if so, how much and how often? On a similar note, it’s also my personal opinion that it’s best to reintroduce just one particular food from a food group at a time – not the entire food group all at the same time, and not a food that contains multiple restricted ingredients. Again, this is my personal opinion, based on my past experiences with allergy-specific elimination diets. The reason is, just because one food in a food group causes a reaction, does not mean all foods in that food group will cause the same reaction, or will cause a reaction to the same extent. Now, I know some will disagree with this recommendation, and that’s okay. Everyone is different and each person should decide for themselves how best to reintroduce suspect foods. I also know some might not like this approach, because it certainly does slow down the reintroduction phase. Yet, it’s been my personal experience that the best way to truly know what the real impact is of each particular food I reintroduce into my diet is to go slow and reintroduce just one food at a time. Otherwise, if you introduce more than one restricted ingredient and get a reaction, you won’t know which to blame. For example, if introducing rice, don’t add butter to the rice, because that would be introducing two restricted foods at the same time. Understanding which foods cause our bodies to react negatively will help us to clearly decide whether the negative consequences of the reintroduced food far exceed the pleasure of eating it, or whether we have some wiggle room to enjoy certain restricted foods from time to time without having to “pay the piper” so to speak. The bottom line – the reason it’s best to only reintroduce one food at a time is because if you reintroduce more than one new food at the same time and get a reaction, you won’t know which food is to blame. What if there are foods I don’t want to include back into my diet? Simple – don’t reintroduce those foods. For example, if you’re not missing beans, then don’t reintroduce them. Instead, fill your plate with other healthier Whole30 vegetables and fruits that you enjoy. 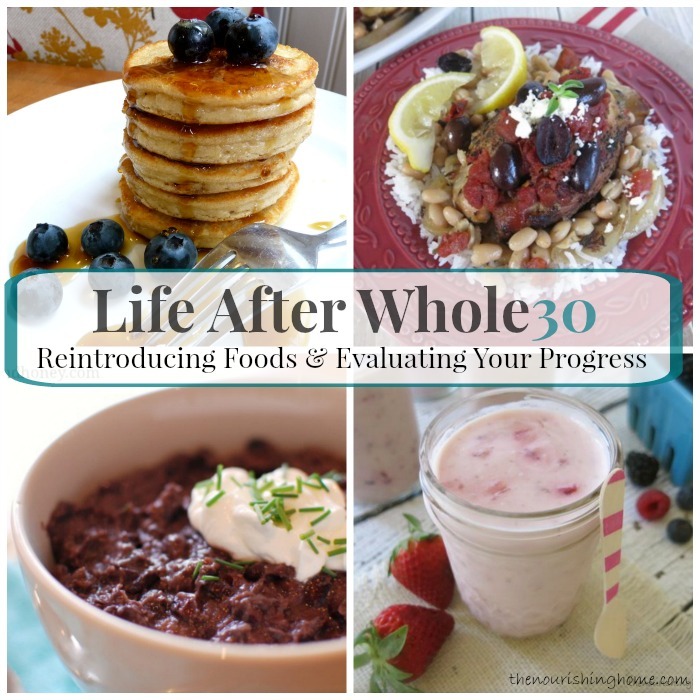 New from Whole30: Create Your Own Custom “Life After Whole30” Meal Plans! Figuring out which foods to reintroduce back into your diet and how often to do so isn’t the end-all of a successful Whole30 program. Instead, taking time to think through what we’ve learned while on Whole30 and then using that knowledge to formulate an action plan for moving forward are truly the most important things we can do to ensure that the healthy changes we’ve made the past 30+ days become a solid foundation that we can continue to build upon. If you’re like me, and so many others who’ve completed Whole30, you’re probably most amazed by the sense of freedom that comes from gaining better self-control as we learned to kick our cravings to the curb and replace them with healthier eating habits. I believe this is truly one of the most empowering aspects of The Whole30 Program and is one that should really give us confidence that we can continue to make positive changes that impact our health (and our family’s) for the better. That’s why I appreciate the practical wisdom of the Whole30 team in encouraging us to really think through our personal life after Whole30 strategy. Each of us have our own reasons for taking the Whole30 Challenge, and these reasons – as well as the personal healthy living goals we set – will greatly influence our commitment to remaining on the path to better health and well-being. Continuing Our Healthy Living Journey Together! Of course, you know that I am always here – as is The Nourishing Home Community – to continue to encourage you and support you with your healthy living goals. So if you’re not already an active part of the community here, be sure to join us by subscribing to The Nourishing Home Newsletter where I share free exclusive whole food GF meal plans, recipes and lots of healthy living tips & resources. And please also join our awesome community forum on Facebook. We’re here to help you continue to make great strides in your health and your family’s health too! What positive changes have you seen as a result of taking the Whole30 challenge? And what is your action plan for reintroducing your favorite restricted foods back into your diet and in moving forward with your healthy living goals? You’ll find my personal story and action plan in the first comment below. I wanted to take a minute to share with you how helpful The Whole30 Program (or in my case The Whole45 Program) has been for me personally. If you read my first post, then you know how I was struggling this past summer with recurrences of pain due to my chronic autoimmune disorders, as well as extreme fatigue and a moody disposition. The good news is, I’ve experienced a significant decrease in pain since starting Whole30 – praise God – and in fact have had virtually no pain since week 4 of the program. In addition, I’ve experienced a much-needed increase in my energy levels, and my family is especially thankful for my cheerful mood! Because I started The Whole30 Program two weeks prior to announcing it on the blog, I’ve already started the reintroduction phase. 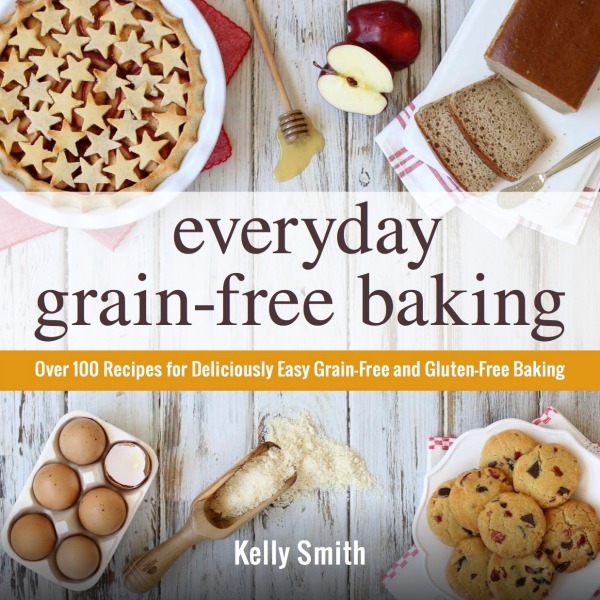 I started first by reintroducing grain-free baked goods back into my diet, making sure that the ingredients in the baked goods are all Whole30 compliant. I’ve also reintroduced butter. But, the jury is still out on this one, since I just started the reintroduction this week. I didn’t notice any negative results on day one, but now that I’ve had butter for three days in a row, I’ve noticed some sinus-related issues. So we’ll see? Now it’s time for you to share your story … I can’t wait to hear how Whole30 has impacted your life and which foods you plan to reintroduce first? Of course, I also hope you’ll report back on how you’re doing with your reintroduction foods. So do you use sweeteners such as honey, maple syrup, or stevia in your baked goods too? ok, im not getting how using only foods youve been eating already for 30 days with no reaction is reintroducing? i dont get how making pancakes from a mashed banana and 2 eggs cooked in ghee or coconut oil is not ok either, but if you eat a banana and have 2 eggs cooked in ghee or coconut oil with it, it’s ok? so glad YOU are having success with eating very strictly. im pretty sure there is nothing that will help me now and im eating pretty much what i want since not having it did NOTHING & was EXTREMELY expensive and time consuming/stressful. of course not eating junk and still eating my green smoothies is part of health but for wgt loss? nothing works for me. Keep us updated! I am very interested in elimination diets. I would love to hear how you know if something is affecting you in a good way or bad way. I pinned this to my Healing Diets board! I am so grateful for the opportunity to do the Whole30 program. It has been such an eye-opener about the effects food can have on your body. After 30 days, my body feels better than it ever has. My joints aren’t aching all the time, my icky digestive issues have cleared up, my skin looks so much healthier and the weight loss has been a real bonus. When I started the Whole30, I couldn’t walk more than 10 minutes or so on the treadmill. Now I’m taking 7 mile walks and doing aerobic daily. Due to my cheating late in the program, I now know that wheat is a trigger for me, so I don’t need to do the re-introduction to figure that out. As for the rest, re-introduction will have to wait. My doctor is so happy with the results I’ve had in such a short time that he asked me to continue on for a while. So Whole 180 here we come! Thanks, Kelly, for the meal plans, the support, and the encouragement to keep going. I’m so grateful that you put so much effort into helping others get healthy. If I take the slow approach in reintroducing food (1 food per 5 days), should I reintroduce on day 1, then wait a couple of days and eat the same food on days 4 and 5? Or should I just eat the same food for 5 days straight? Thanks for your help! Today is my last day of the while30. Yay!!!! !